Since Bermuda grass is a warm-season grass and fescue is a cool season grass, the two seem like a match made in heaven. Unfortunately there are problems mixing the two grasses. First, Bermuda likes to be mowed low and fescue likes to grow taller. Also, both types of grasses need nitrogen fertilizer, but on completely different schedules. Still, mixing the two grasses can help homeowners to keep a green-looking lawn all year long. Wait until fall, when the weather begin turning cooler. The best time of the year for overseeding with fescue is four to six weeks before the first killing frost for your area. Mow your Bermuda grass low, setting your lawnmower to a height of about 1 inch. Use a thatch rake to remove all the dead thatch and to slightly score the top of the soil. Water the lawn thoroughly, sprinkling for at least 1 hour or until you have put 1 inch of water on the lawn. Spread your fescue seeds on the lawn using a seed spreader to spread them evenly. Use 5 to 10 pounds of seeds per 1,000 square feet of lawn. The more seeds you use, the thicker your fescue lawn will be. Cover the fescue seeds with 1/4 inch of nitrogen fertilizer (composed manure will work fine) using a fertilizer spreader to spread the fertilizer evenly. Water your lawn one more time to dampen the fertilizer and the seeds. 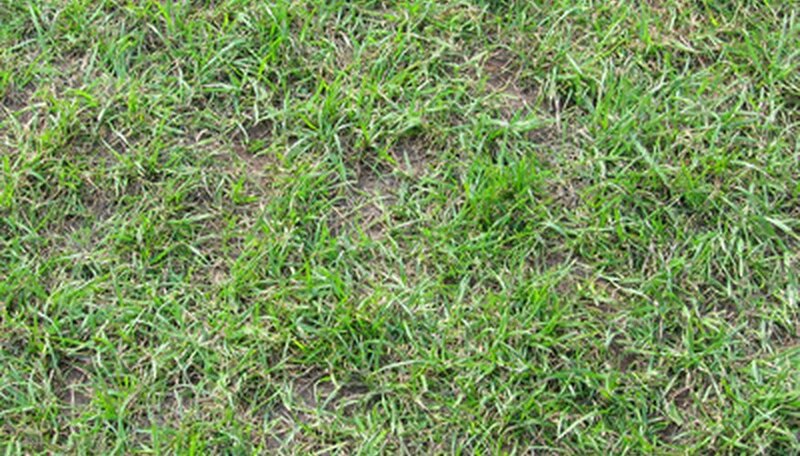 Keep the lawn damp but not soggy until the fescue begins sprouting, in approximately seven to 12 days. Do not let the ground dry out completely until the fescue has grown approximately 4 inches tall. Set your mower to 3 inches and mow your fescue lawn 21 days after planting. Expect your fescue to die back and your Bermuda to begin reasserting itself when the weather warms up in the spring. Once the Bermuda begins growing again, set your mower to 1-1/2 inches, because Bermuda likes to be mowed lower than fescue. Minnesota State University: What&#039;s Best for Overseeding Bermuda?